Ok, maybe the title is a bit presumptuous. Certainly I couldn’t tell you how to do everything in Senegal. But, below is a brief report for current and future travelers looking for tips on how to travel around Senegal and do some of the things we’ve done on our trip; plus some cultural tips. Taxis: Yellow and orange taxis are a great way to get around Dakar. Negotiate your fare before you enter the taxi. Always greet a taxi driver with the customary, “Asalaam Malekum,” it’s just nice and will win you negotiating points. We stayed in the neighborhood of Nord Foire, near Yoff, and the fare for going all the way to downtown Dakar (Place de l’Independence) was 2500cfa. Going from SICAP Baobab to downtown costs 1500cfa, just to give you an idea of the distances and associated fares. Car Rapide: These are a fun way of getting around Dakar if you have more time. They go slower as they make stops and have set routes. Nord Foire to the University costs 150cfa. You can ask the driver hanging off the back “Fo dem?” (where are you going?) or just say the place you want to go with enough inflection to justify the question. Sometimes you may have to take a couple of car rapides to get where you want to go. Best to ask a Senegalese for help. 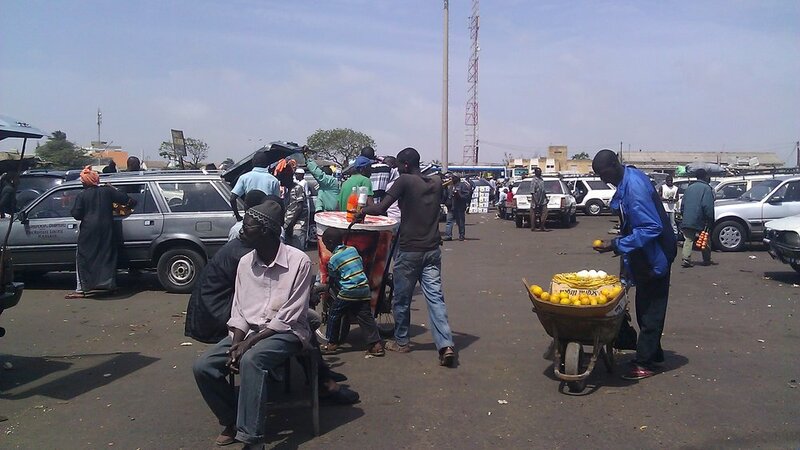 Waxale (waa-hall-ey): Bargaining in wolof – your greatest tool in doing business in Senegal. A very loose rule of thumb is that you’re going to pay 1/3 – ½ the price the vendor gives you, depending on what you’re buying of course. And, naturally, everything does have a set price, so often times it’s good to know in general what things cost. For example, if you’re buying wax cotton fabric, you’ll buy 6 meters at a time. Qualities vary, but say the vendor quotes you 10,000cfa for the package. Your starting price should be around 2000, knowing that in the end you’re going to pay 4000-6000 for the entire 6 meters. That’s $8-12 at the time of writing. Lac Rose: Lac Rose is a naturally occurring pink salt lake about 40km outside of Dakar. Apparently it’s saltier than the Dead Sea, and like in the Dead Sea you can float. There’s a small salt village on the south side, and from the north side you can walk across the dunes to the beach. There are a couple of ways to get to Lac Rose: taxi/hired car or a combination of bus/sept places (bush taxi). The bus/bush taxi option requires a couple of changes, one in Rufisque and another in Keur Massa, then you have to walk up to 5km unless you can get a taxi that is reasonably priced. But know that you’re probably going to have to pay the driver to drive back to Keur Massa (with or without you). We hired a taxi for the day for 20,000cfa ($40). We may have been able to get a better price, but the taxi was arguably the nicest taxi in Dakar, and the driver, Lamine, was quite friendly. He picked us up at the house, drove us to Lac Rose, and waited the entire day while we walked around the lake, swam and had a meal. Yeah, it was an expensive day, but it was nice to get out of Dakar. When you arrive, there will certainly be people on hand to sell you anything and everything you want/need/don’t need – including piroque tours, dune buggies, and touristy gifts. They’re persistent so be firm if you don’t want anything. People in the salt village are very friendly if you’re open and interested in chatting with them. There are campements and a hotel around the lake where you can stay if you want to spend the night. Otherwise the hotel is nice for taking a meal or snack and then swimming/floating in the lake. Aside from the far eastern corner of Senegal, the Casamance was the one area I didn’t get to see when here as a student in 2003, so I was excited to be able to go. Beginning with the Sine Saloum river just north of the Gambia, Senegal becomes a lush, green expanse of river-meets-ocean mangrove forests. This landscape extends all the way down through Guinea-Bissau, Guinea and into Cote d’Ivoire. Our trip took us from Zinguinchor on arrival, to a beachy place between Cap Skiring and Diembereng and then back to Cap Skiring. It is possible to take buses/bush taxis down from Dakar, crossing the Sine-Saloum region, the Gambia and the River Casamance. Crossing the Gambian border aside, I’ve heard this trip can take almost 24 hours, given the number of river crossings, and just the snail-like pace it would take to drive that far south in Senegal. We opted for the ferry. Purchase tickets at the same place where you purchase tickets for Goree Island in downtown Dakar. You’ll need your passport and cash. You can buy return tickets at the same time. Ferries leave Tuesdays and Fridays at 20h (8pm) and arrive around 10am. Return ferries leave from Ziguinchor Sundays and Thursdays at 15h (3pm) and arrive in the early morning in Dakar. It takes 14 hours one-way. You should buy tickets in advance. The base price for a stripped-down airplane-like chair is 15,000cfa/pp one-way. However, for 18,9000cfa/pp you can get a bunk bed in an 8-person cabin. You will need to reserve at least a week in advance to get a bed. There are also cabins for 4 and 2 people, but they were quite expensive. Given the fact that Jon was sick on the way down and I on the way back, getting a bed is the best option. In the seated area, people tend to arrive early, lie down across 2-3 seats and stay there all night. We were pretty much without our seats on the way down, which was a real drag. We also recommend bringing sandwiches, beverages and snacks. If you need to eat on the boat, buy a sandwich (1200cfa) when you get on, as they’ll sell out, forcing you to eat in the (very expensive and not tasty) restaurant on board. Ziguinchor – Cap Skiring/Diembereng: on arrival at the Port, you’ll be descended upon by taxi drivers. We paid 1000cfa to get from the ferry to the Gare Routiere (bus station). From there, we bought seats in a sept place/taxi brusse (bush taxi) for 1700cfa/pp to go to Cap Skiring. Given the fact that it’s a 2 hour drive, I thought that was a good deal, You don’t bargain for these prices, they are pre-set and the drivers won’t try to oversell them. Be sure to ask for seats “devant” or “au milieu” so that you don’t have to sit in the way back, it’s crowded back there. We also paid 500cfa/pp for our luggage. You’ll have to wait for the taxi to fill up, but if you don’t want to wait you can buy the other seats. There are also minibuses and Ndiaye Ndiaye (25 seaters that pack in about 40 people), I don’t know what the cost is and they go a lot slower ‘cause they make stops. We got picked up in Cap Skiring by our hotelier, Augustine. Hotel Oudja is situated between Cap Skiring and Diembereng, and was about at 20 minute drive. The hotel was nice, a bit overpriced I think, but we did have the whole place to ourselves the first night, which meant having a private beach. Not bad. We spent an afternoon in Diembereng, which is a big village right on the edge of where the southern bank of the River Casamance meets the ocean. It was an expensive taxi – 6000cfa round trip. Diembereng is a sweet town and the locals rival Malians in terms of kindness and how open and welcoming they are. We ended up hanging with our taxi driver a bit, and I think he was so excited about us being Americans that he offered to take us to his village of Bouycotte, which was on the way back to the Hotel. It was the best spontaneous adventure as we got to meet his father, and take a walk into the palm forest to try palm wine. Cool. We ended up hiring the same driver to take us to Cap Skiring, where we spent 2 nights at the Hotel Balafon. Balafon is situated right in town off the main drag – great for getting a taste of the village, plus you’ll get to meet some locals. There’s a fantastic restaurant on the road between the hotel just before you get to the main drag. Can’t remember the name, but it’s chef is a Senegalese who must have studied in France. Their house-made pasta is some of the best we’ve had – period – be sure to try the crab ravioli. For 4500cfa a plate, or 11000cfa for two people with drinks ($22) – that meal was a steal. We ate there both nights. On Sunday we woke up early to take a sept place back to Ziguinchor. It took about an hour for the car to fill, but that’s why we built in enough time so as to not miss the ferry. You have to board the ferries about 3 hours in advance – a Senegalese inefficiency, but at minimum they close the gates 1.5 hours before departure. Don’t be late!! Overall, Casamance was a beautiful change of scenery and pace, but it was a very expensive excursion. 4 days including transportation cost us more than our entire time in Mali and Dakar combined. Ouch. As with all trips, you can choose your transportation method depending on how long you want to spend on the road. The large buses cost about 3000cfa for the supposed 4 hour journey (I would imagine it takes much longer though). Minibuses are around 4000 and the sept place/taxi brusse is 5000cfa/pp plus 1500cfa/pp for luggage. It took us about 3.5 hours from Gare Pompiere, Dakar to the Gare Routiere in St. Louis, which isn’t quite in the center of town. We stayed at Zebrabar, 15km south of Dakar on the river Senegal. It’s a nice place that has a variety of accommodations. Food is expensive which makes up for the money we saved in staying here. It seems like the real deal here is to camp and bring your own food. We’re moving into town for a couple of days before taking overland transport to the Rosso border crossing and into Mauritania. Hope this has been helpful to anyone taking these trips in Senegal!